Demented mind at work...faint of heart do not enter!!!!! You and your boyfriend have just spent an hour fighting off demons and monsters in your 3 story house. It all started while you were in the attic getting Halloween decorations out of boxes. You are both now on the first floor and have fought off numerous hideous beings with everything from a gun to pieces of broken glass and you have come out of it with minor cuts and scratches. You have hurt one of your legs badly and can only limp and your boyfriend has hurt one of his arms to the point that it's useless. A fire has started on the second floor and the ceilings are falling in and there is smoke everywhere. There is very little light because it is after 10:00 and most of your lights have burned out from the fire but you do each have flashlights. You have made it to the front door and open it....you look outside where your car should be and all you see is total blackness. Nothing! No street lights, passing cars...you can't even see the walkway to the street. It's as though you had your eyes closed. You stick your arm out the door and don't even feel the usual evening fall breeze. There are none of the usual sounds. The neighborhood dog is unusually silent. Your listening to hear the sirens from the fire trucks that should be on the way since the fire is getting so out of hand...but you don't hear them! Something seems terribly wrong! What do you do? Do you go out that door into the total darkness and take your chances? Do you close the door and sit in the house hoping to hear fire engines coming to save you? What would you do? OMG!!! Pinhead!!! Now you're really freakin me out, haha. Hmmmmm, this is a tough one...hmmmm...well, we do have flashlights, right?..... I'd rather be outside (still up that tree from the last story, haha) but since this one's different, I'd probably make a run to the car using one flashlight, sort of like a quick peek and turn it off, quick peek and turn it off, just to get a view of where I'm headed. I'd be looking for that darn rubik's cube box too and send Pinhead back home, lol! The house is out....I wouldn't stay in there, no way no how.......the smoke will get ya and your eyes will burn and you won't be able to see anything at all....ewwwww, a scary thought!...............This was fun too! HAHAHA!...sometimes I make myself laugh after I re-read my posts.. Thank you for best response!....I can't wait till you do another one...I've sent people over to check your first spooky story out, and then I found this one... Ahhh, the simple pleasures of life, hahaha! I think people have become tired of my little stories now. I had loads of responses on the first one but less on this one. I think I need to cool it now and think of Christmas or thanksgiving now. Today is the first time I ever heard of Dexter and I think later tonight I'm going to watch him on "on Demand"...it looks very good! 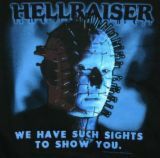 I love the hellraiser movies too! I think they are really awesome and gory, just what I love in horror movies, lol. I definitely wouldn't stay in a burning house, ctry. Fire has a way of spreading very quickly. I would step out into the darkness-both flashlights blaring- and take my chances. I would trust that since we're both all banged up, the adrenalin would kick in at the right moment should it become necessary. "Oi, Pin, you got those kebabs ready yet, the rugrats will be here any second and I still haven't removed all the shaving cream from my crevasses from last year. And will you kindly put another coin in the dimensional destabiliser please, I want to see the litle horrors this time. Thank the Chinese it's only once a year, I swear I couldn't handle it any more than that . . . I'm not covered for stress . . . and my hair, how that hell am I going to get rid of all that white? Whoops! Hang on a sec., was that 'Bride of Frankenstein' or 'Nightmare on Elm Street'? Damn, I'm already freaking out. AAAAAAHHHHHHHHH! well that's a really interesting scenario, that's for sure. I would just go out in total darkness and take my chance. If i sit there, chances are it won't help me much. I would probably just end up catching on fire. I think if my life were at risk I would try my best to live.